Just trade 15 times from your Tradier account and they'll pay for your Quantcha subscription! Register a free Quantcha Evaluation account using the same email address as your Tradier account. You don't need to sign up for a paid subscription here because your Tradier brokerage account will be billed directly for months where you don't trade 15 times. Once you've funded your Tradier brokerage account, link your Quantcha and Tradier accounts. 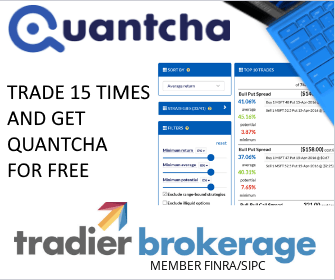 Tradier will cover your Quantcha subscription fee every month you complete at least 15 trades!